Right-brain learners think intuitively and respond well to open-ended activities. Right-brain learners employ a common sense approach to problems. Right-brain learners make subjective statements. Right-brain learners are spontaneous, impulsive, flexible, and creative. Right-brain learners solve problems through synthesis. Right-brain learners express themselves candidly. Right-brain learners prefer essay tests. Right-brain learners lack a strong sense of time and structure. This is very interesting. I’m curious, how can someone determine whether or not that are considered a left or right brain learner? Is it based solely off of whichever one they match more characteristics with? Thanks and keep sharing such valuable information. Hello, Jay: Yes, one identifies as a right-brain learner or left-brain learner by resolving whether he or she possesses more of the characteristics of one over the other. Thank you very much for reading and your support. No problemo. It’s a great post. Thanks a lot for answering my question. I appreciate that. 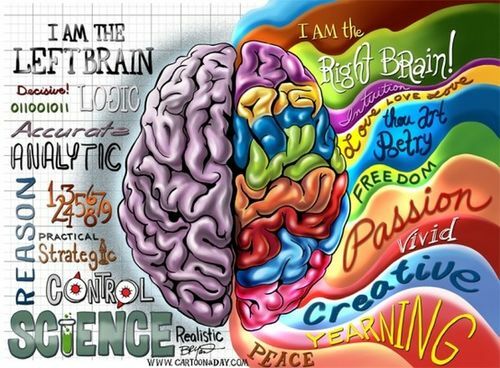 I am right brain and some left brain, go figure. Thanks for your comments in 2015- be blessed in 2015! No problem. Blessings to you as well in 2015! Yep, I have a right brain especially the creative and the lack of strong sense of time! I am a right-brain learner too. I certainly have to work on my sense of time.